As we dive headlong into what’s sure to be the unprecedented @#$%show of 2019, it’s time to start the new year off right by making wild predictions about the comics industry which no one will remember if we get them wrong, but which we’ll be able to brag about through 2020 if we get any of them right. 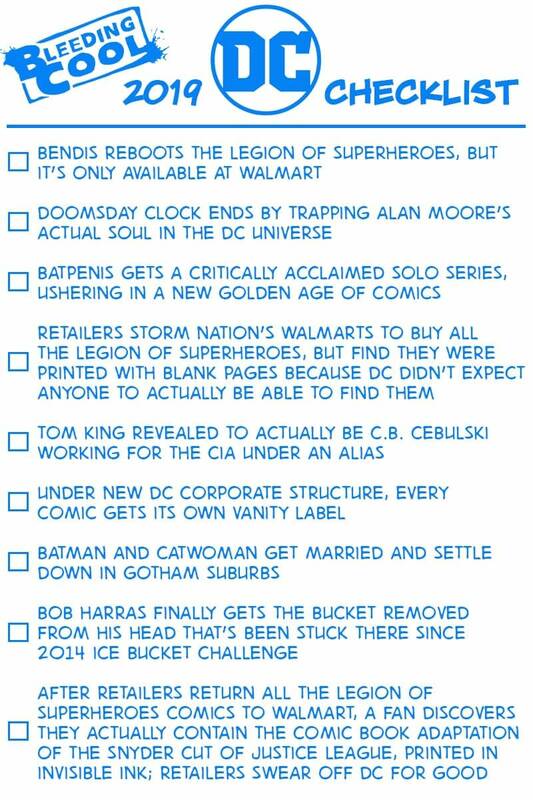 Using our vast “journalistic” resources and unparalleled knowledge about the comics medium, we’ve compiled a list of ten likely predictions for DC Comics in 2019. Print out a copy of the checklist below and check off the predictions as they come true. If we got it right, remember, you heard it here first at Bleeding Cool. If we get it wrong, well, plans can change and all that.